Almost completely unknown outside Andros, and there only to a few, Righteous Chrysanthi was both an enigma and a blessing to those who knew her. Of these we can count only a handful of villagers and the monks of St Nicholas Monastery who visited her lonely monastery above Batsi. Abbott Dorotheos was for some years her confessor. Chrysanthi had no family and had gone, perhaps as a young girl, to live in a monastery in Siseroes. She was never officially tonsured but had been blessed, like a novice, to wear black and live and work alongside the nuns. She was a bright, pious girl and in 1943, when the local bishop began making innovations in traditional church practices, she fearlessly disputed them with him. Although young, she was a staunch defender of everything handed down to her from the holy men and women she had known, and finally the irate bishop sent her to the Monastery of the Life-Giving Spring (Zoodochos Pigis) on Andros. She was twenty-three years old and her exile lasted fifty years. Why she didn't leave and go elsewhere is known only to God. Her life was a mystery to those around her; at times she was sage and serious, at other times almost like a fool-for-Christ in her cheerful poverty and seeming indifference to hardship. Whether she had consciously foreseen and accepted these trials early in life as God's providence for her salvation, no one is sure, but it is known that she accepted her lot uncomplainingly, and at least once was granted a vision of the Mother of God. 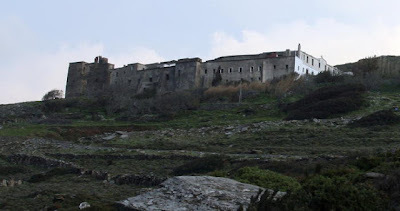 The Monastery, sitting atop a hill half-way between the coastal villages of Batsi and Gavrion, is an old, huge stone foundation, which throughout the period of this story housed only a handful of nuns (all of whom have now reposed). In the winter, fierce, wrenching winds blow through the monastery, and in summer the heat scorches the barren hilltop to a dull brown. For the five decades Chrysanthi lived here she endured much from the other sisters, both because of her status as an exile and because she was simply different- she lived a life apart from theirs. Normal, even kindly women in their own way, the evil one incited the sisters to an intense dislike of the girl that continued throughout her life. Her first abbess at Zoodochos Pigis loved her like a daughter, but after her repose Chrysanthi was treated as an outcast. She did not sleep with the handful of other sisters, who themselves lived very simply, but in an unheated store-room with a dilapidated wooden floor in a ruined part of the monastery. Her room, when the author saw it about six weeks after her death, was filled with rubble piled five feet high like a barricade: bits of wood, oil cans, rags, and pieces of broken furniture. A further room was full of gunny sacks. In one far corner were some paper icons on the wall, and a pile of cloth and cardboard on the floor where she slept. It was difficult to make one's way through the rubbish. She spent much time outdoors in the hills and in the small chapels dotting the island. The other sisters' aversion for her was so strong that they would not allow her into the monastery church, and even in winter she was forced to stand outside during services. The monks of St Nicholas however told me that she would often slip quietly into the back of the narthex, listening intently and crossing herself with great vigor when the saints were mentioned. Not only was she not allowed in church, but the sisters would not let her eat with them. After their own meals were finished she would creep into the kitchen and take a little of what was left over. Even in the bitter winter cold she was not permitted to warm herself in the heated living quarters but would kindle a small fire in the unused, centuries-old kitchen off the courtyard. When the sisters discovered her there, they put out the fire and drove her away. Why the other nuns acted like this is unknown, and certainly not typical. Most likely they had come to the isolated monastery as uneducated girls from surrounding villages, and after the first abbess reposed simply lacked competent leadership. They are perhaps more to be pitied than condemned - the succeeding abbess was not well-trained enough herself to give them a proper formation, and they did not have a resident spiritual father. Fallen nature took its course, and Chrysanthi, as both an outsider and a disgraced 'exile' became a scapegoat for the sisters' irritations. In other ways the nuns were quite normal.The author met several of them after Chrysanthis' repose, and found them welcoming and hospitable. When the old nuns were no longer able to take care of the monastery business, Abbott Dorotheos began to come each month to help assist them in business matters and hear confessions. Although he admonished the nuns about their attitude towards Chrysanthi, they were simply too entrenched to change. When he heard confessions, Chrysanthi would wait quietly in a corner of the courtyard until the other three sisters finished. Only after they were gone would she slip in to speak to him. Abbott Dorotheos says she had an acute mind, and would talk to him in great detail about the needs of the monastery, as if she herself was the abbess. Excluded as she was from the society of the other sisters, he never understood how she knew much more than they did about monastery business. Sometimes she predicted what would happen if a certain course was followed, and she was always right. She never complained about how she was treated, and seemed to have fully accepted the cross of her life, neither shrinking from it, nor being beaten down by it. She never expressed a desire to leave. Chrysanthi was unfailingly cheerful, and always the first at the gate to welcome guests, with whom she would warmly chat until the other sisters arrived and sent her away. Father Vlasseou, one of the young monks of St Nicholas Monastery who often accompanied the abbott, used to sit with her in the courtyard during fine weather, where she would speak to him of God, the saints and spiritual life. He remembers her as being unlike anyone he ever met, and says that there was an otherworldliness about her that he found indescribable. Once, when Abbott Dorotheos was at the convent he told the nuns of the centuries-old tradition that on the feast of Theophany, all of the salt water in the sea turns sweet. On Old-Calendar Theophany the nuns went down to the shore, with Chrysanthi following behind. They all took a cup of the salt water, but three tonsured nuns couldn't drink theirs- it was salt as usual, only Chrysanthi's was sweet, and she drank several cups, exclaiming, "It's sweet, it's sweet." Three days before her death on St Spyridon's Day in 1992, the Mother of God appeared to Chrysanthi while she was praying and said, "There is no abbess here. I am the abbess. Have patience for a little longer and I will come and take you, and then you can rest". Chrysanthi was extraordinarily happy and told the other sisters what she had seen. They accused her of inventing it to annoy the abbess, and treated her particularly roughly for the next few days. On the third day as she tried to make her way back across the courtyard against a savagely bitter wind, she became too weak to go on. Slipping into an empty room a few doors from her own, she quietly died. Abbott Dorotheos was called, but when he came to say the first prayers for the departed, the sisters insisted he should not pray for her in church, but outside in the courtyard. Even after her death they spoke badly of Chrysanthi, and Father Dorotheos, angered by their callousness, told them, "She was the best of you all". He read the prayers over her body in church, and the next day she was wrapped in a blanket and buried. There was no coffin. On the ninth day after her repose, Father Vlasseou, accompanied Fr. Dorotheos to serve the pannikhida (prayers for the dead) at her grave. He relates that the bitterly cold wind was blowing so fiercely they could scarcely stand upright as they made their way up the hill. As they came within a few feet of Chrysanthi's grave, however, the wind stopped completely, and although they could hear it blowing all about them, around her grave it was still, and even warm. The candles stayed alight, and when they finished singing the pannikhida they turned to incense the other graves-but as soon as they stepped outside the shelter of Chrysanthi's grave, the wind hit them again with full force. The author was present for prayers on the fortieth day after Chrysanthi's repose, and as we were sitting over coffee, one of the old nuns looked out of the window and began crying, "I see her, I see her, there's Chrysanthi". The abbott smiled and told her gently to sit down: "Chrysanthi is no longer with us". But she kept insisting, "Don't you see her? She is right there walking on the hill!". Righteous Chrysanthi, pray to God for us!. From Evlogeite, A Pilgrim's Guide to Greece, p. 96-100.